A colleague of mine, Rajesh Chabbara, who is the Asian Editor of Ethical Corporation Magazine and writer of an excellent blog, CSR Works, alerted me to an interesting report from Singapore, published by City Developments Ltd. I reviewed this report for CorporateRegister.com. You can find my full review here. You can download their report here. "City Developments Ltd (CSL) is a property and hotel conglomerate operating out of Singapore. The company is one of the biggest landlords in Singapore with over 7 square miles of leased and rented properties, and extensive interests overseas in a range of locations. This report covers Singapore only where the company employs around 300 people. The first thing that strikes me about this report is its pleasant design using pastel-shaded vines as the core theme. I love their bar charts of data designed in the form of leafy vines. Managing Director Kwek Leng Joo (brother of the Company Chairman) says: "The CDL Sustainability Report 2010 is aptly entitled “Grow”. The vines symbolically articulate the rapid expansion of the sustainability movement in our Company." Indeed, this is one of the nicest designs I have seen – creative but not over facing, bold but modest, and one which blends perfectly with the spiritual undertones of this report, as in the opening sentence "We set our sights on higher standards, remain nimble and strive to reach for the skies". Beyond the aesthetics, this report is of high quality and claims to be the first Sustainability Report that has been assured using the AA1000 AccountAbility Assurance Standard (AA1000AS Type 2 Assurance) in Singapore. It is the Company's third report, complies with GRI application level B+ and has 5 main sections: Marketplace, Environment, Employees, Community and Governance. What is apparent early on in this report is that CDL targets to be somewhat of a leader in Singapore with a desire to spread the CSR message and drive the market forward. This is a declaration which we do not always see in sustainability reports, and several examples of how CLD put this into practice make this more than just an empty promise. This is the first company I have seen reporting use of the ISO 26000 framework as a guiding document for its CSR planning and development. I wonder if it offered them any new insight. " Aside from the really great report design, and advanced progress in green building and prominent position in developing a sustainable Singapore skyline, including the 11 Tampines Concourse, the first carbon neutral development in Singapore, what is interesting about this company is the way it leverages its strong position in Singapore through the real estate, consumer and business markets to influence key stakeholders (indirect impacts) . CDL encourages business tenants to Go Green! and issues them with an Eco-Office Kit which encourages them to engage in environmentally friendly practices in their business. Similarly, homebuyers are offered Green Home tips. In CDL's shopping mall, shoppers are incentivised to buy eco-friendly products and can check the latest emmissions level of the mall or solar energy usage as they engage in modest consumerism. What would round this off for me is whether any of these excellent initiatives are actually making a difference, not only in making Singaporians more aware of environmental issues, but in whether any are changing their practices in business and the home, before being required to do so by law. I would like to see CDL present data about what impact they are having, in addition to the focus on what they are doing. However, what they are doing is a good start and appears to demonstrate leadership in this market. Globally, the Company has achieved a certain recognition, being the only Singapore developer to be included in the FTSE4Good index. City Developments is ranked number 296 out of 1000 in the Global 1000 published by CRD Analytics on Justmeans, a pretty good position, and is also ranked 81 in the Corporate Knights Global 100 list for 2010. As an aside, the CDL website links to the Clean and Green Singapore (CGS) website, where there is a CGS song. I have posted before about sustainability songs (my blop called Sing Sustainability with Henkel), and this one is also well worth a little singalong. Anyway, now that I can count on you to join the local Sustainability Choir, take a look at CDL's report and yes, you guessed it, send them your feedback! Ethical Corp sent me a free review copy but they didn't tell me (or ask me) what to write. "Corporate interest in socio-economic impact is increasingly driven by much more important drivers than simply external reporting. Certainly reporting remains important, but more and more companies are realising that understanding socie-economic impact - the interrelationships beteen the company and the societies in which they operate - is also a vital tool for strategic and operational management and decision making." This quotation from the introduction to this study of socio-economic impact proves that it's not just about numbers for numbers sake. It's about deriving value from measurement and reporting. This is quite heartening, despite the fact, as is also mentioned in the report, that at present, there is only a very small pool of (primarily large) companies who even get close to the level of measurement and reporting that actually delivers value. However, the authors of this report point to a fundamental redefinition of the role of business in society and the engagement of business in what otherwise might be known as "development projects" (as the NGO community tends to refer to them) such as poverty reduction, healthcare and human rights. The report was developed using data from a wide range of sources including a literature review, 2 anonymous surveys of CSR professinals and practitioners (116 and 50 respondents), a round table discussion atended by 100 experts, review of 60 MNE's CSR communications and reporting and around 30 telephone interviews with key CSR practitioners. Enough to get a good overview of the key issues, I would have thought. 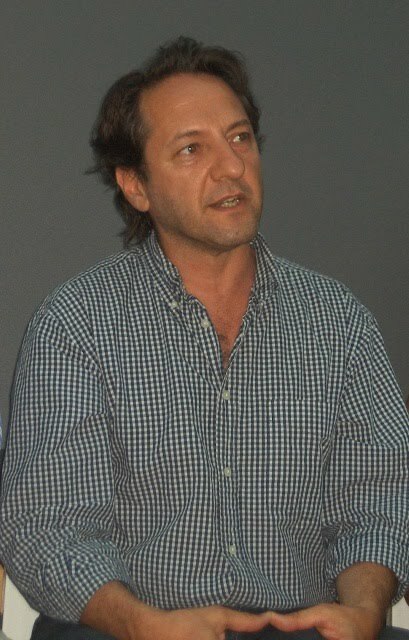 As we all know, there is a plethora of external standards and indicators used by companies ranging from the loosely structured UN Global Compact, through various specific initiatives and indexes such as DJSI, CRD Global 1000 and more, and culminating in the "ubiquitous" Global Reporting Initiative which claims that over 1,500 companies use its framework. Most companies use some sort of framework in deciding how to measure and report their social performance and economic impacts. There are upsides and downsides to this approach, described in the report. This tends to be prevalent in apparel, coffee, tea, timber, chocolate and footwear industries, to name but a few, with a focus on human rights rather than wider economic impacts. There are well known frameworks including the ILO Labor Conventions and others which address these issues, with auditing being one of the most widely spread tools. Sedex offers a plaform for inputting audit data so that customers can evaluate the manufacturer's performance in this area. A case study from Nike described in the report helps understand the implementation and issues surrounding such auditing processes. Another case in point is the recent hullabaloo around the Hershey's cocoa sourcing supply chain, which you can read in my blop here, and the supply chain sourcing standards established in this industry sector. 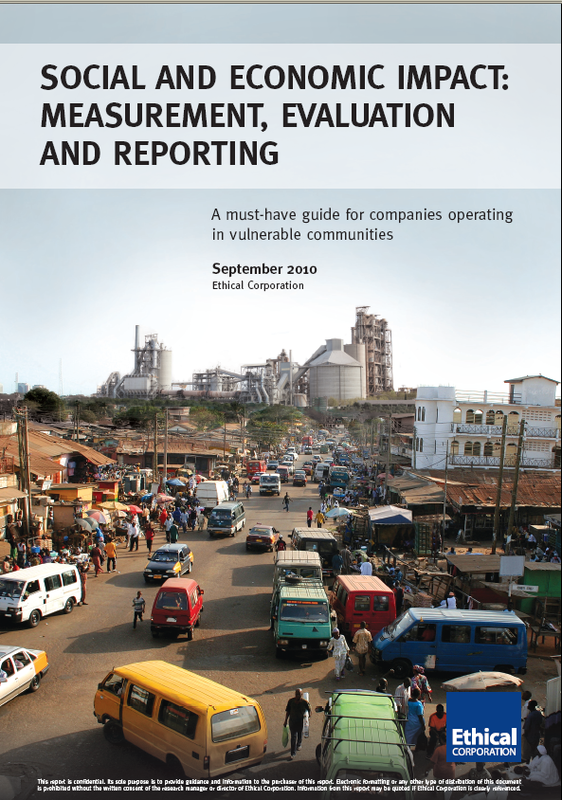 This type of assessment tends to be used by companies which have a strong socio-economic footprint in a particular geographic area and is particularly relevant for the extractive sector. The report cites the Anglo American Socio-Economic Assessment Toolbox as one of the best-known tools to help companies understand their local impacts. In addition, a number of multi-stakeholder partnerships operate in specific sectors or industries to ensure consistent development of standards, management of expectations and a sort of level playing field for all. The report assigns primarily a commercial interest to the development of this type of assessment becuase the proximity to local communities creates a kind of interdependency which is critical to the success of the project or venture. This type of assessment is rare, and adopted by companies who have a sustained long-term interest in coutries or territories in which they operate. Unilever, Procter and Gamble, Vodafone and Heineken are cited as examples in this area. Heineken for example employs 1,000 people directly in Rwanda but estimates that its activities in that country provide employment for over 35,000 people. This is a significant level of influence and Heineken has developed a tool to help them understand their impacts in more detail which is discussed in this report. You can also read about this in Heineken's Sustainability Report. One of the things that surprised me in this report is the assertion that, whilst there are various states of play in measurement and evaluation of socio-economic impact by the corporate players, as mentioned above, there is much greater discipline and advancement in this area by the NGO community, including the DCED Standard for Results Measurement in Private Sector Development programmes, which focuses on the scale of initiatives, the increase in income by the targeted enterprises and the net additional jobs created. This seems to be a very interesting tool, though the extent to which it is effectively used is not quite clear to me. Other frameworks such as the WBCSD model which was published in 2008 are also discussed in some detail. The use of these tools in the corporate sector is extremely fledgling, though there may indeed be some relevance to the argument that there is learning to be gained from NGO's in this area. What are the things most companies are measuring ? The summary report also covers some practical information which gives some benchmarking value to practitioners as they decide to embark on their own impact study. 30% of those who have performed such studies confirm they are not a five minute job, but take longer than 20 days to develop. (This surprised me, I would have thought that any serious study would take significantly longer than 20 days!) . 28% pay $10,000 or less for such a study, and 18% pay between $30,000 and $100,000 (40% didn't spill the beans). All in all, this 55 page report provides a very interesting overview of most of the key points in this vastly complex area of CSR and Sustainability practice, which is growing in importance. To quote the report, "Where the leaders lead, others follow", and there is no doubt that some of the advanced practices by the more forward-thinking companies are catching on. The report offers suggestions as to the directions this enitre field of activity is taking and some recommendations for those thinking of developing their own practices. It's a good piece, informative, thought-provoking and educational. I personally gained important new insights from this report. I hope many companies will do also. Christine Arena, CEO of SparkUp and great CSR author, blogger and #CSR Debate moderator, made me aware on Twitter of the "real" Hershey report. And that is well worth a blop (= blog post for those not used to my lingo. Yet). First, Hershey, with great fanfare, published their first ever CSR Report (GRI Level C). This is the real report. 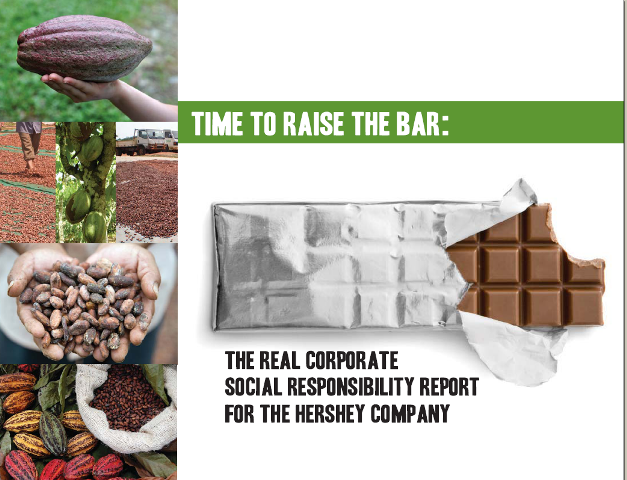 This report, as might be expected, presents Hershey's strong commitment to Corporate Social Responsibility in all aspects of its operations, including management of the Hersey supply chain and cocoa sourcing. Second, a group of activists and campaigners for human rights including Global Exchange, Green America, The International Labor Rights Forum and Oasis USA published a mock CSR report attacking Hershey for human rights abuses in the production of cocoa. This is the real "real" report. In this report, the campaigners focus primarily on what they allege to be forced labor, child labor and trafficking in the Hershey supply chain, greenwashing regarding charitable and community activities in West Africa which mask the underlying human rights problems and urge Hershey to increase transparency and adopt full sourcing of Fair Trade Certified (TM) Cocoa. So which is the real real real report ? First a look at both reports and then some perspectives of my own. The Hershey report follows the Quadrant Model (marketplace, workplace, environment and community) and, despite no evidence of materiality thinking and proiritization, the key headlines are covered in greater or lesser detail. These include promoting responsible consumption of snacks and treats as part of a healthy lifestyle (really? ), supplier diversity, nutrition labelling and nutrition research (how many phytonutrients in your daily diet, hmm? ), promoting health and fitness, marketing with integrity, plus all the regular disclosures and case studies relating to environmental stewardship, repsonsible workplace and community contribution. There is a two page section on "Addressing the Challenges in Sourcing Cocoa" which reconfirms Hershey's commitment to "embrace our responsibility to ensure that the cocoa we buy is grown and harvested in a sustainable manner. That means encouraging a cocoa supply chain that provides adequate incomes to small cocoa farmers, advances efforts to promote responsible labor in cocoa-farming communities, promotes gender equity and protects and preserves the environment." All in all, Hershey says, through their efforts in West Africa, "Hershey and its industry peers have made a positive impact on an estimated 500,000 farmers and their families—about 2.5 million people altogether." There is no doubt that this is a good news report, very skillfully copywritten, designed to paint a very rosy picture of the Hershey Company. Its transparency is limited to the direct impacts that are non-controversial in terms of disclosure and the report is not assured. Nonetheless, it does demonstrate a certain level of CSR commitment and practice, which cannot be denied. First: In sourcing much of its cocoa from West Africa, Hershey does not have a system in place to ensure human rights abuses are eliminated. Second: Hershey does not disclose its cocoa suppliers in West Africa, therefore making it difficult to monitor human rights issues. Fourth: Hershey does not adopt the Fair Trade Certification for Cocoa, "the strongest certification system available" for all but one of its chocolate products. The report refers to a shareholder resolution submitted in 2006 to Hershey, that was rejected, to push Hershey into reviewing and reporting on supply chain sourcing and addresses why Hershey is purchasing from "the three companies,Archer Daniels Midland, Cargill, and Nestlé, which are involved in the ongoing lawsuit in US courts on child labor claims". Similarly, the alternative report looks at leading practices in cocoa sourcing and commitments by other manufacturers and shows how Hershey is lagging behind. Additionally, the report makes recommendations to Hershey for resolution of this issue through to the year 2022. Whether you are transparent or you are not transparent, you are transparent. No company can hide from transparency. It's either forced or it's voluntary. In the same way that Gap Inc and Nike and others realised that the only way to gain benefit from transparency is to embrace it and work with it, so Hersheys, sooner or later, will have no option but to go this route. Whilst a first CSR report is a step in the right direction, transparency on the most material and critical issues cannot be avoided. 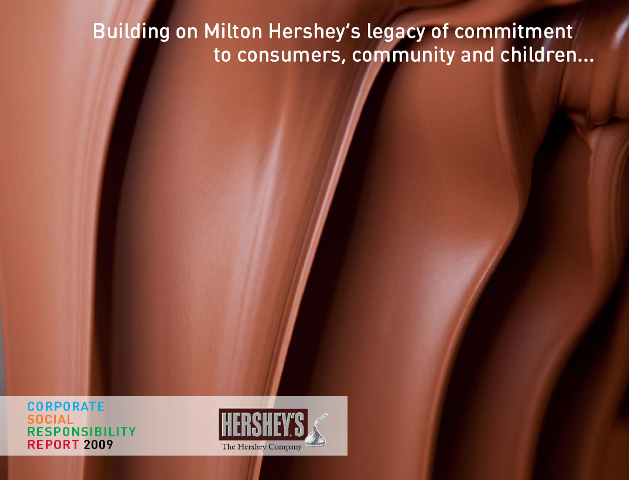 Hershey lists the stakeholders they engage with in their CSR report, which includes interest groups, NGO's and the World Cocoa Foundation (established in 2000, Hershey is a founding partner), but they don't drill down into the details of their engagement. The coalition of human rights activist groups who wrote the alternative report don't appear to rate this foundation, which focuses on good work without the same activist edge. In deciding whom to engage with, a company should not cherry-pick around who to talk to. If you do not engage with your strongest critics, you are at risk of them engaging you in a way you may not have anticipated. On the other hand, engaging with such critics may well provide a platform for your business to create new commercial opportunities and longer term sustainability. Both the real report, which is good news, and the real real report, which is bad news, are guilty of imbalance in communications. Both tell one story only. The one which advances their agenda. And let's make no mistake. The profit agenda of a corporation and the non-profit agenda of NGO's are also driven by people with personal interests and much to gain, one way or another. This approach to one-dimentional reporting undermines the crediblity of both players in this sad scenario. There is no doubt in my mind that, even if Hershey people have an adequate defense to the allegations in the real real report, they must respond and disclose an action pan to address the issues raised. Whether or not everything is true, or not, there is surely something that Hershey can accept as a way forward. I don't believe that Hershey can maintain a credible CSR positioning without doing this. The first response should be a public invitation to the real real report authors to meet with Hershey leadership and table all issues at a facilitated conversation in open and positive spirit. Wow. That' s a conversation I would be happy to facilitate! The story of the Hershey Trust decision to sell the Hershey Foods Company to the highest bidder, which was recounted by Andy Savitz in his book, The Triple Bottom Line. The story is amazing and shows how Hershey blundered through a process that caused stakeholder uprisings and ultimately had to back down, "squandering valuable social capital". Hmm. A lesson not learned, it seems. The story of Starbucks and the Ethopian coffee farmers, which was the subject of an Oxfam led campaign, which went pretty viral with people from all over the world posting videos in support of Ethiopian farmers, eventaually forcing Starbucks to give in. Starbucks did, and went on to build stronger reciprocally positive relationships with Ethiopian coffee farmers. A lesson learned, apparently. Seems like Hershey has a knack for doing things the hard way. At least, as I have a few (ok, a lot of) pounds to shed, I wont have to ponder the issue of whether to eat Hershey's chocolate or not, for the time being. I will be watching for Hershey's to respond, however. Hopefully they will do so before my diet turns once again, into the tomorrow diet. Haha. (Oh, and in case you are wondering, I did write directly to Hershey with my queries about this issue. I hope they have something to say). The Global 1000 Sustainable Performance Leaders ranking for 2009 was unveiled this week by CRD Analytics, made public for the first time, and hosted exclusively in a searchable, filterable data base on Justmeans. I wrote an editorial for CSRwire.com, examining some aspects of this ranking which you can read here. In brief, this is a comprehensive ranking of Financial, Environmental, Social and Governance (FESG) performance of publicly traded companies with over $1billion in market capitalization and having produced a CSR or Sustainability report. The top 1,000 companies are selected from a total pool of over 5,000 potentials. The ranking factors in performance data using GRI G3 indicators, and more, with 200 individual metrics. The methodology which underpins the G1000 is called Smartview(TM) and is also used to power the Nasdaq OMX CRD Global Sustainability 50 Index which was launched in June 2009. Martin Smith, CEO of Justmeans, who co-hosted the Justmeans-CRD Analytics webinar held on Wednesday said " This is the most robust methodology I have seen" (for ranking sustainability performance), and I agree with him. The purpose of hosting this ranking on the Justmeans platform is, according to Martin, to "speed up the rate of disclosure" With everybody's data out there for everyone to review, the expectation is that, in addition to the attention given to these rankings by the investor communitty, Companies will start to realize that transparency as well as performance is the name of the game for all stakeholders, and will be anxious to ensure that their place in the rankings continues to improve. This is the essence of the race to rank. Whether you like it or not, if you are a publicly traded company, you are in the race. The Smartview(TM) methodology uses the four FESG dimensions, 20 key performance indicators and 200 individual metrics. The performance of each company is presented on a 360 spiders-web wheel , giving a visual representation of a company's total performance, and clearly highlighting areas where a company shows leadership or areas that need more work. One of the important factors in this methodology is the integration of actual performance as well as disclosure. If a company has not reported, they dont get a look in. And that's good, because responsiblilty without transparency is a non sequitur (That's Latin for oops!). Michael Muyot, President and CEO of CRD Analytics, who developed the Smartview methodology, shared some interesting data about the improved performance over time of Companies who have been evaluated using this methodology. This shows, in a rigorous, verified analysis, that global companies that improved on ESG performance from 2006 to 2008 outperformed the MSCI World Index by over 11.6% from 2008 to 2009. That's pretty persuasive, and something investors are understanding how to work into their analyses and evaluations. The value of presenting this ranking data for all to view, together with subsequent updates, serves to heighten awareness of the performance of companies, both for stakeholders and for the companies themselves who are looking to improve their performance and position in the rankings. CRD analytics do not consult to Companies who want to improve their position, in order to remain totally independent as they do their analytics stuff. Instead, CRD work with a range of consultants who know the GRI framework and the Smartview(TM) methodology well and who can advise Companies on what they need to do to improve their performance against the required performance metrics. (Disclosure: My Company is one of those consultants). CRD's core service provided to companies is reports - company reports, industry or sector reports, deep dive custom built reports etc which give companies a powerful set of analyses which can be used for planning, proritization and performance improvement. At present, the plan for the G1000 on Justmeans is twice-yearly updates aligned with the timings in the year that most companies tend to publish most of their data. However, the potential is to update more frequently - say quarterly or even monthly. The ultimate would be to update the list day-by-day, whenever companies publish new data, giving an absolute real-time view of where individual companies are and how they stack up against peers. This would certainly quicken the pace of the race. The faster you disclose performance, the faster companies will compete for top rank, just as they compete for investor attention, shelf-space in a supermarket or air-time in the media. This is a good thing, as to improve rank, you need to improve performance. The faster this can be done, the faster we realise our global goals of sustainability. Rankings are not just random or futile exercises. There are many which are not terribly scientific and not reliable as a reflection or predictor of sustainable performance. I am convinced that the Smartview methodology is different. And moreover, I am convinced that a professional, credible ranking drives companies to improve performance. Just looking at the Smartview data, which underlies the G1000 ranking, once can see the year-on-year progression of both transparent disclosure and quality of action. Our efforts towards Sustainable Development were also viewed positively by the capital markets, as MOL – exclusively in the Central-Eastern-Europe region – has become eligible for inclusion in the Sustainability Yearbook 2010 (bronze class), published by Dow Jones Sustainability Index’s analyst, SAM. The acknowledgement that MOL is among the top 15% of Sustainability performers in the oil and gas industry is the direct result of our long-term focus on those environmental and social areas that are critical to our sector such as climate change, transparency, occupational health and safety,attracting and retaining top talent and customer relationship management. In addition, our managers’incentive bonus scheme is partly based on performance indicators related to their individual SustainableDevelopment targets. This strong position is reflected appropriately in the 2009 Global 1000 ranking. The 264-page 2009 annual report includes 34 pages on sustainability performance (assured) and a further 25 pages on governance. The report conforms to application level A+ of the GRI Reporting framework, an increase in transparency versus 2008 (B+), and 2007 (undeclared level). The improvement in the G1000 ranking position reflects stronger performance and stronger reporting in all ESG categories, whilst improving overall financial strength in 2009 versus 2008. Whilst achieving a higher ranking specifically in the G1000 may not have been top of mind for this Company, a focus on improving sustainability performance and disclosure was. As a result, this Company is now on the radar and very much in the race. Being in the race to rank delivers reputational benefits and is a catalyst for performance improvement. Competing in the race is a sure-fire way to get stakeholders to sit up and notice, and even engage. Hah! And that is where accelerated positive impact on sustainability will be created. The Big CSR Debate : Elvis rules!! So, the BIG CSR debate has come and gone. Did we learn anything new? Well, frankly, the only thing that was new to me was the total extent of the disconnect between the views of Dr Aneel Karnani and Chrystia Freeland and today's external reality. At some point, the only way both could feel comfortable about CSR was by calling it simply "good management" or even better "acting in self-interest to make a profit by observing the law". If that is what CSR is all about, then, as Aron Cramer put it, there is a problem. Karnani let himself neatly off the hook by saying that there is no definition for CSR. In fact, this debate might have been called a "dialogue de sourds", where 5 out of 7 people were talking coherently, and two were throwing out a whole series of "wobblies" (a great term used by a former boss of mine), not many of which were accurate, relevant or even interesting. I missed the first part of the debate, so I don't know if it actually started out with an agreement of a definition of what people were going to talk about. In fact, 5 people were talking about one thing, and two people were talking about something else. And there was no middle ground. At the point at which I hooked in, Chrystia Freeland of Thomson Reuters was referring to "CSR rhetoric", "milk and motherhood and apple pie", and "feel-good win-win Kumbaya language". This might have been relevant about 10 years, ago, but her needle has clearly stuck in that groove. Today, CSR is about strategy, shared value, business opportunity and addressing global challenges. Karnani lives in a world where governments everywhere are icons, where they regulate for every possible impact of business, and enforce every regulation with such perfect finesse that no corporate anywhere is ever able to do any harm to society or environment in any capacity whatsoever. Aron Cramer says this exists only in North Korea, a model which he does not recommend for the entire developed and developing world. Guess we can understand why. Ultimately, the CSR anti's were putting up smoke screens – the very smoke screens they accuse responsible business of wielding to mask their irresponsible practices and the "deceptive dangers" of CSR. Chrystia Freeland kept harping on about the fallen-halo of " Beyond Petroleum" when in reality, everyone stopped believing that slogan many moons ago, and no educated business person would consider that as part of the current CSR Kumbaya. Another needle, another goove. Chrystia then turned her sights to Microsoft who has just been accused of collaboration with the Russian Government to crack down on outspoken advocacy groups and opposition newspapers. Yep, not a nice story. But Microsoft have issued a full and frank explanation and confirm that "to prevent non-government organizations from falling victim to nefarious actions taken in the guise of anti-piracy enforcement, Microsoft will create a new unilateral software license for NGOs that will ensure they have free, legal copies of our products." Such is the world of CSR. No corporate is perfect. Georg Kell of the Global Compact made this point well. He said "we have to recognize that most big dilemmas are not so easy to solve - climate, poverty and other global issues do not follow a clean simple path, commitment to a non-financial issues is uneven progress, it is very hard to be on top performance in all domains all the time. We have to accept the dynamics of regulatory changes and what business can contribute. Private solutions spill over to the regulatory machine. Where there is a conflict you have to tackle the conflict and work out where you stand." This rings true. The multiple touch-points of any large corporation which impact on so many aspects of our lives are continually being discovered and addressed. The fact that companies haven’t yet buttoned everything down in a nice neat package for every aspect of their business everywhere cannot be an argument for the failure of CSR. Real CSR is that they are willing to try. Dave Stangis, who told Campbells Soup's Board when they hired him, that he is not a treehugger, but a capitalist who believes in helping them make more money (but in a way which creates positive social impact), says that this state of EITHER – OR makes him crazy. I identify with that, though Karnani and Freeland seem to have problems with the concept of co (co as in shared, together, participative, partnership, working together, interconnectedness, leveraging joint strengths, engaging). The possibility that there is an overlap between the contribution of business and the role of governments in contributing to global sustainability is off their radar. Bob Corcoran gave an example of how GE supported Transparency International in establishing a framework for anti-corruption. But this was dismissed by Chrystia as self interest on behalf of GE, because, she said, apparently GE is apparently not so good at corruption and their competitors are better, so leveling the playing field had to be about regaining competitive leverage for GE. Come on. Is this drivel or is this drivel? Matthew Bishop, of the Economist, was an eloquent contributor to this debate and got to the crux of things quite effectively. He made the point, which I also subscribe to, that the problem with stock market capitalism is that it overly focuses on short term measures of performance. 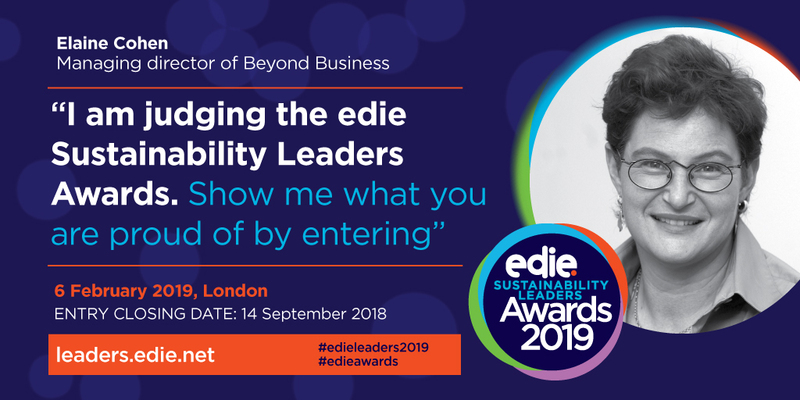 He says that visionary business leaders are on the side of preparing themselves to be doing things which move the business forward in a sustainable way. Karnani had an answer to this, of course. He says " Shareholders should demand that business be long term. It's a governance problem" . Perhaps Dr Karnani would like governments to regulate that shareholders may only invest in businesses whose governance allows only for a long term shareholder return? Yup. That would work. Not. Bishop again: "How effective regulation can actually be? There is a huge problem of corporate money in America, lack of transparency in corporate lobbying, a lot of our institutions are not being held to account properly" Nail on the head. Chrystia, continuing in the self-interest groove, raised the issue of Pepsi who on the one hand, sells a product which has "no redeeming value to society" whilst engaging in all sorts of great CSR activities. She calls soft drinks the next "tobacco", pointing out that Pepsi lobbied hard against a soft drinks tax. Hmm. Matthew Bishop wasn’t having any of that. He says that when companies make a claim such as the Pepsico "Performance with Purpose", they are held to account. He says that Indra Nooyi's performance in this respect should be judged by the media and all stakeholders on those promises "Where's the beef, Indra? everyone should ask. He says that this is going to be the defining issue of her career. Rounding off on this short summary of this long debate, the likelihood is that the camp you started out rooting for is the camp you remained in. And that camp won. If you believe that CSR is a smoke-screen to mask corporate self-interest which is in conflict with the public good, and that the only bodies that corporations should be held accountable to are governments, then you can shake hands with the Karnani-Freeland double act. If you believe that CSR has a valid role to play in improving society and planet whilst enabling businesses to deliver long term shareholder and stakeholder value, in a way which is core to business strategy, then you have many more hands to shake. If you are undecided, as Aron Cramer says, 50,000,000 Elvis Fans can't be wrong. Go with the majority! Kudos to Susan McPherson and Fenton for organizing this session and to Christine Arena for skillfully navigating the lion's den. And as it is the start of Yom Kippur, haha, I ask forgiveness for having no patience for arguments that hold back progress. Jo's Gems - Confino in action! Ok, that's the easy bit over with. Now for some of Jo's Gems. Jo's talk was a fascinating mix of philospophy, the expression of values, the business case for sustainability, the difference sustainability can make to the Guardian and vice versa, and some practical tips and advice for companies. Below are just a few of the insights Jo shared. Everyone has to have meaning. Even someone who buys paperclips can have as much meaning as journalists. A Zen Buddhist Master told me that "we are eating our children" (but neglected to say whether this is after they have been seasoned with organic herbs) (sorry, couldn't resist that last comment). Integrity is not just a physical thing. You must also have integrity on the indside. There is a point at which you can hide from truth and change, and a point at which you cannot. You have to have a sense of purpose. We are opening ourselves up, allowing others to see what we are doing and get involved. Once, a newspaper printed an article and put it out there, and that was that. Now, putting the story on the website is just the beginning. It's like saying: Here's the article, now let's have a conversation. The web is about sharing and becoming a hub, and not being proprietorial. Businesses can now see that they can make money from sustainability and that it can be a core business benefit. CSR is like the American Cavalry Bugle for businesses. Years ago, the only thing that businesses knew what to talk about was money, there just wasn't a vocabulary of sustainability. It is hard to envision exactly what the future will be. We can't see beyond the current system. But you have to set goals, even if you dont know how you are going to achieve them. We are on a runaway train to hell . We are using 5 planets. Sustainable consumption may invite a lot of cynicsm, but all the major companies are now talking about this. Good reporting should be a force for change. It is important to have an independent verifier. For the Guardian, this was critical because of the Guardian's independent voice in the media and the desire not to compromise that. Companies are very fearful of the media, but if you are open and honest, you gain more respect. We have to accept that eventually, the printed newspaper will become a niche product. The only thing that will keep newspapers going is the lack of technology to provide adequate alternatives. We wanted to tell the real story about the way community development took place in a local community.. not just tell the good news .. but tell the truth. We wanted to focus on one project and "get under the skin" of what's happening and leverage this in a transparent way. The success of the project wasn't the success of the project. It was how successfully we managed to bring out the true story, day by day. Our commitment was demonstrated by having two Ugandan journalists, one actually living in Katine, covering the progress and events on a regualr basis. The biggest Agent of Change is the leadership. The leaders have to "get it". It is important to get the leaders on board, but then you have to create structures to make things happen. One of the core challenges at the Guardian has been to ensure Directors set their own measurable targets in the areas they manage. THANK YOU to Jo for giving of his time and thoughts so generously. Thanks to the local CSR organization, Maala, for working so hard to organize this event with us. 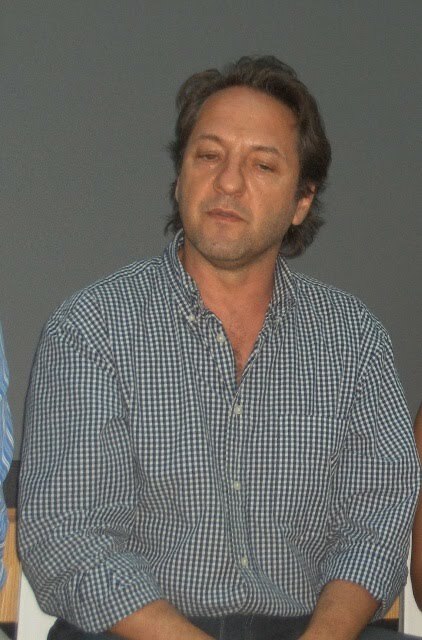 Thanks to the local office of BBDO (Gitam) for hosting the event with Jo. Thanks to The Marker newspaper for their interest in what Jo has to say and for, we expect, great coverage of his visit in the local press. And thanks to all those who attended Jo's talk. This was a great event and Jo was an inspiration to all, despite the fact that he didn't mention Chunky Monkey even ONCE in all the time he talked. BT is getting connected ! I was preparing my review (coming soon!) for CSRwire and my CSR-Books blog of the recently published book, Accounting for Sustainability, in which there is a case study of BT and its approach to sustainability strategy and reporting. In the meantime, as I went to check out the BT 2010 sustainability report, I thought I would highlight what does appear to be their good practice in the analysis and quantification of sustainability intiatives. The report covers materiality, the result of a considered process of analysing and prioritizing business and stakeholder-raised issue, and a range of other sections relating to social and environmental impacts. At the heart of the report is a KPI table, included as a separate PDF download here. There are 12 core non-financial indicators, with performance shown for the last three fiscal years, and a set of corresponding financial indicators, showing what financial impact is delivered by the performance against each of these non-financial indicators. The financial measure of the non-financial indicator "Improving Customer Service", for example, is total revenues and average revenues per UK household. An increase in the BT employee engagment score delivers a financial impact on employee costs. The lost time injury rate target has a financial impact on the cost ot the business resulting from injuries arising at work. The implementation of BT's Human Rights Standard in supplier procurement has an impact on the value of human-rights-approved procurement as a percentage of total supplier spend. Investment in society delivers an impact on the financial bottom line in terms of the overall spend in cash, time and equipment donated. Reducing carbon emission intensity delivers a financial effect on overall energy costs. An ethical performance measure delivers an interesting financial impact which counts revenue support - the number of customer bids which require a sustainability component. Interestingly, BT have a diversity target to maintian a top ten placement in four of five diversity benchmarks, but note that they have been unable to develop an appropriate financial measure for this non-financial target. I believe this is good practice and clearly influenced by the "Connected Reporting Framework" proposed by the book I have just read. However, it's just a start. The value of assigning a financial result to a non-financial target can only be meaningful if you show the investment in performance development alongside the overall result. Average revenues per household may have increased, but what cash investment in customer service programs were necessary to deliver this improvement? What incremental safety programs, and at what cost, delivered the reduced cost of injuries to the business. What investment in carbon emission intensity reduction was needed to recude energy costs? There is not always a clear linear relationship between all these numbers. This demonstrates the rigour of thinking necessary to put all these sustainability initiatives into nicely separate "financialized" compartments. I think BT are doing well to make a first stab at this, and I would be really interested to see them take this thinking further. Oh and as for diversity .. no financial measure ? What about the cost of additional efforts to recruit and retain a more diverse workforce against the benefit of low non-diverse turnover ? What about the financial contribution of women / minorities / disabled etc as a percentage of revenue generation? What about the cost of competing in all these external rankings against the value benefit of reputation enhancement ? Haha. That one was tongue in cheek. Getting the CSR message through! I am pleased to make you aware of a first Communication on Progress published by the great CSR news distribution company CSRwire, LLC - whom most of you probably know via the News Alert which promptly plops into your inbox every morning with the latest CSR news and interesting editorials (haha, disclosure, some of them are mine!) . Anyway, if this plop thing doesn't happen to you, I would strongly recommend you sign up and get the News Alert. Whilst you are doing so, check out the rest of the site and see how CSRwire can help you get greater exposure for your CSR news and get your CSR message through! What I really wanted to do was congratulate CSRwire on the submission of a first COP to the UN Global Compact. (oops, time for another disclosure, I worked with CSRwire and helped develop this COP). As most of you may know, the UNGC is a voluntary policy framework established 10 years ago by the UN to help drive responsible business practices according to 10 core pinciples. Businesses who wish to participate willl send a signed commitment to the effect that they will uphold the principles, spread the word around and report annually on what they have been doing in this respect. Over 5,000 businesses accross the world have committed to support this framework. A Communication on Progress is usually a positive document which doesn't require full disclosure in the same way as a comprehensive Sustainability Reoprt type GRI does, but it can contain considerable information and is an excellent route to supporting accountability and developing a culture of transparency. Accountability and transparency is not new to CSRwire as they are a certified B Corporation, and have been practising responsible business practices since the very start of their operation in 1999. However, the CSRwire COP is a very full document, the most transparent ever published by CSRwire, and describes their business mission, profile, history, responsible practices, targets for the future and most importantly, the most material element of the company's work, the way CSRwire delivers and distributes CSR news so that the CSR message gets through to an increasingly wider range of readers all over the globe including corporate practitioners, CSR professionals, non-profits, academics, students and opinion leaders. With over 5,600 members and 250,000 page views per month, and growing, this is a strong reach. Also important is the fact that CSRwire is an SME, a small business with 12 employees. Even a small business can do their stuff responsibly, and actually, it is vitally important that small businesses do do their stuff responsibly. The UNGC route is a great framework for smaller businesses to start building their Sustainability Stamina and gain global recognition. SME's who read CSRwire's COP can gain inspiration and ideas for how they might follow suit. I hope many do. See it on the UNGC website here. Anyway, rushing off now to a Chunky Monkey event. YEAH! Not too many daily newspapers around the world report on sustainability. In fact I dont think any others do. In this respect the Guardian seems to me to be unique. 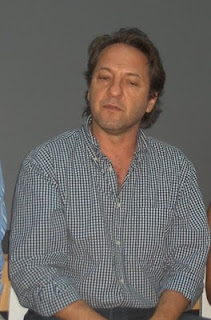 It is also unique in that it has Jo Confino, the passionate and committed champion of the Guardian values. It's no coincidence that I decided to post about the Guardian's report(ing) at this time. You see, Jo Confino is coming to visit us in Israel this month, and we have organized, in partnership with Maala, the local BSR affiliate, a meeting of members, clients and the general public, for Jo to share his insights, experience and achievements at the Guardian, and talk about the role of the media in supporting (or not) sustainable business practices. We are very proud to host a true Sustainability Celebrity. I am expecting he will teach the Israeli press a thing or two! The Guardian has been producing Sustainability Reports called "Living our Values" since 2003 but I am going to fast-forward and stay present with the 2010 Living Our Values report. I guess it's not easy to be a print newspaper in this digital on-line-everything age when the world has become one big citizen-journalist and headlines reach Twitter before most have even realised they are headlines. A report in the Media Guardian in June 2010 talks of overall decline in newspaper circulation in 20 out of 30 OECD countries, with a 30% decline in the USA and a 25% decline in the UK between 2007 and 2009. Sales of the Guardian fell by 10.5% in the year ending May 2010. So the first question that springs to mind whilst reading a newspaper sustainability report is whether this is actually an unsustainability report, for a business which is slowly becoming an anachronism. If that's not a material issue, I don't know what is. (OK, I do, but I'm not telling). ** A new revenue stream through the creation of the Digital Agency which is producing websites for clients, rather than just selling them advertising. ** The creation of Guardian Sustainable Business, a venture aimed at supporting companies in acting on their social, environmental and economic impacts. 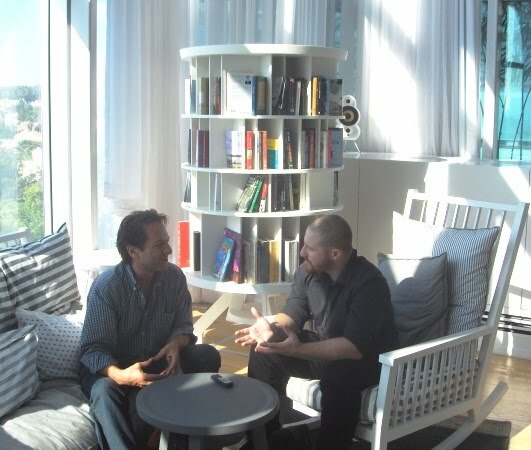 **Opening up new licensing models and new platforms, such as subscriptions on Kindle and the Sony eReader. Both the iPhone app, which is paid for, and the iPad photography app, which is free because it is sponsored by Canon, are making a positive financial contribution. The iPhone app sold 121,000 in its first 16 weeks on sale. **Significantly expand international operations, given that the overseas audience represents more than half of total audience, but only 7% of revenues . But what about he fact that everyone is now a journalist? The answer appears to be "collaborate or dry up!" The Guardian recognises that "preaching to 21st century stakeholders is no longer the answer". Engagement with stakeholders is the name of the game and the Guardian does this well. The core theme of the report is well in line with its concept and title - living the values. Perhaps this is best demonstrated in the section relating to the engagement of employees and the commentary about the employee survey. This is a fine example of good disclosure relating to empolyee practices and includes some self-criticism. Other aspects, such as fair and free journalism are discussed at length, including the position of values related to earning from advertising which is in conflict with editorial principles. I must confess that for a simple soul like me, the online format of the Guardian Living our Values report is a little confusing. It all looks like the Guardian newspaper-on-line and untill the penny (sheqel) (cent) dropped, that all the Sustainability Report content pieces are dated 6th Juy, it took me some time. The Sustainability Report even has an Editorial, which is not run-of-the-mill CSR report lingo. Alongside the actual report bits, there are also actual archived news bits. I like a simple life. I like to see reports in a clearly defined location, distinct from the rest of the corporate communications. However, I cannot deny the advantages of this format, which facilitates buzz-up of every page, and invites comments from the general public on each individual article which makes up this report. It's a bit like how to eat an elephant. You can digest the Guardian Report one bite (byte?) at a time. A nice touch is for those who really can't stomach an elephant, no matter how many bites, is a save-the-elephant 15-minute digested read providing the basics of the report in an Executive Summary. I also struggled with navigating this report. There is no content index, and finding specific information requires some digging. Side-navigation bars disappear when you go to read specific articles. I think that, whilst the concept of a newspaper making a Sustainability Report look like a newspaper is quite neat, in practice, I think I would prefer it to look like a report. However, for the general Guardian readership, this may well be the best way to get the report noticed. This being said, the pioneering Guardian is serious about sustainability as their fine set of targets and reporting against those targets shows. There is well considered thought about materiality and stakeholder engagement is covered off nicely. The journalist-Guardian-article style format has broad readership appeal and is less dry than some of the report doing the rounds today. And the report is assured. There is no doubt that values are alive at The Guardian and intgrated into the core business model.. Oh, and if you don't know what mutualisation means (guilty! ), here is your chance to find out. PS: The Guardian Media Group is owned by the Scott Trust. That's an interesting story. Check it out here.